Ship, which launched on the App Store last month, allows friends to appoint users to swipe potential matches for them. If you constantly find yourself entangled in your friends’ dating life, a new dating app lets you take control. 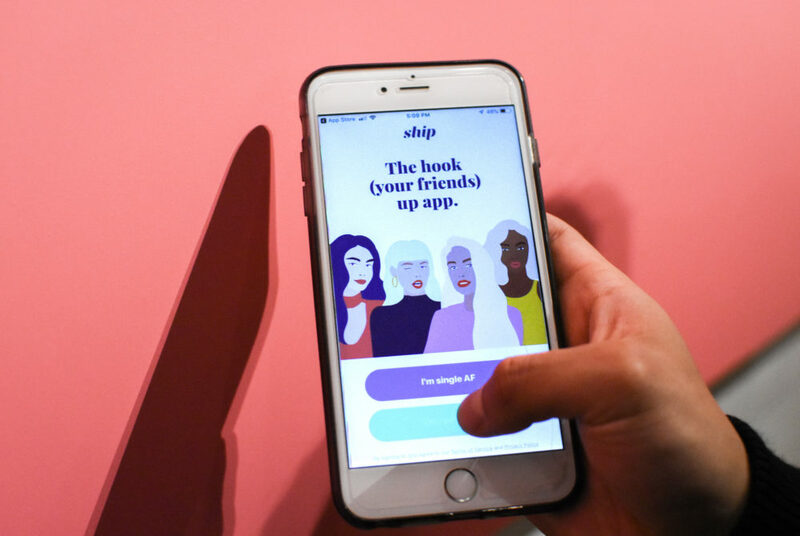 Ship, which launched on the App Store last month, allows friends to be more involved in each other’s dating choices by signing up as either single or taken. The service is just like the plethora of other app options for singles, but taken users can swipe through the prospects on behalf of their friends. The app – made by the Match Group, which owns Match.com and Tinder, and Betches, a digital media company – allows singles to set up a crew of two or more people to swipe alongside them. After setting up your profile and detailing the type of relationship you want along with your height astrological sign and how much you exercise, drink and smoke marijuana, singles toss some of the power over to their friends to swipe to their heart’s content. Two writers – one single and one taken – used Ship for the past two weeks to test it out and are dishing about the pros and cons of using the app during the season of love. Katherine: As someone who loves to know every detail about my friends’ lives, using Ship was a blast. Under the crew activity tab on the app, I can see every person that my friend deems good enough for a right swipe as well as whenever she begins a conversation with a match. The people I choose are prioritized in my friend’s feed and even if she swipes left, they become a match because I liked him. This led to some joke matches followed by lectures, but I deem most men unworthy of my friend so it certainly puts me in more control. Olivia: I loved handing the responsibility of swiping on dating apps over to my friends. It takes all the pressure off of me and my friends can take the heat when a match goes bad. But I was surprised when matches popped up that I hadn’t even seen on the app before. It was frustrating because it could give people the wrong impression if I would not have swiped right on my own. Katherine: Olivia and I signed up for Ship four days after it was first offered on the App Store last month. After giggling and setting up our profiles, we quickly got to swiping but realized there were only two guys on Ship in all of D.C. and even after increasing our radius to 200 miles, there weren’t any additional prospects. Every day we have used the app for the past two weeks, I find more men on my feed to send her way. But right now, Ship is limited in its ability to serve as a primary dating app because of the low number of users. Olivia: I found that many guys on Ship were out of my target age range, which was 18 to 24. But as the app grows, users may find more college-age people. The other downside is that it has not released an Android version yet, so while two of my roommates could join my “crew,” the third had to look on with me because her phone was not compatible. Katie: While it may be rude, I love screenshotting profiles of possible Tinder matches to scrutinize in a group text. While bios are limited on most other dating apps, Ship’s option to add extra bio information made me even pickier. If the guy feels the need to put his height, I deem him too shallow. If he thinks his star sign is important enough for a profile, I question his personality. This ensures my friend is only matched with the best of the best. Olivia: I didn’t add that much information to my Ship profile because I didn’t think potential matches would be interested in niche information like my star sign. I was also hesitant to provide a lot of information up front before I even matched with someone. That being said, the app does allow people to get more personal and go beyond just swiping based on looks, which I appreciated. Katherine: I looked at Ship as more of a game than a viable long-term dating solution, but I do see the possibility for success on the app. While we monitor the same people, we didn’t have to clutter our camera rolls with screenshots to get opinions on matches and it was fun to have a say in my friend’s dating life. Olivia: I really enjoyed giving my friends free rein to swipe as they liked on Ship. While I didn’t agree with all of their selections and thought my lack of control could send mixed signals to my matches, swiping with my friends was a lot more fun than swiping by myself.